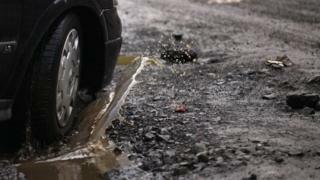 Flintshire council is facing a £2.1m shortfall in its road maintenance budget. A report said it would cost £2.7m just to keep its roads in their current condition but just £600,000 has been set aside for maintenance this year. Report author Steve Jones said budget cuts had "led to an increasing backlog of deteriorating roads". He said the council received "numerous" claims from people following trips and falls on public roads.